I got this floaty pencil the other day. 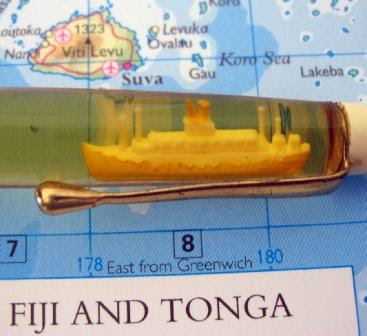 Tilt it this way and little ocean liner sails to the front. Tilt it back and back she goes. I believe they still make floaty pens, but their heyday seems to be long over. A lot of the old ones have leaked or dried up so that they aren’t floaty anymore. This one still works fine, except for the air bubble. 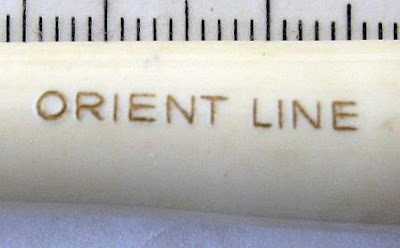 So, this pencil is from the P&O liner the S.S. Oronsay. Built especially for the Australasian service (UK to Australia/NZ/Pacific) she was launched in 1950, and sold for scrap in 1975. Like many of the old pencils of this design, it has warped with age. 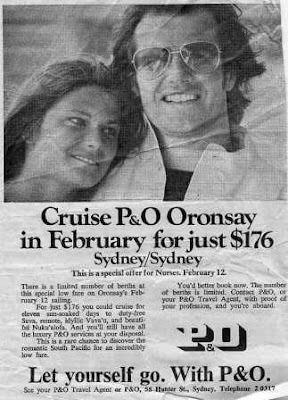 Check out this newspaper advertisement for the Oronsay. I’ve cut out the last line of the heading. Special prices for nurses! No idea how many nurses it encouraged to go on the cruise, but I can’t help but imagine that upon seeing that ad a fair few young cobbers down their local Sydney watering holes suddenly started thinking that maybe going on a cruise might not be such a bad idea. 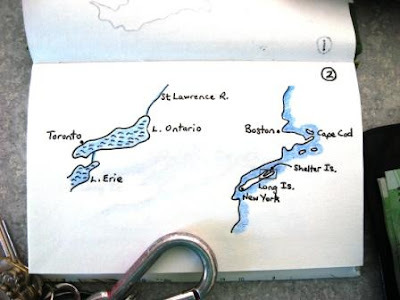 My notebook benefactor in Canada has been at it again. This time a little notebook from The Vespiary. Well, there’s a new word for me for a start. Basically vespiary is to wasps, what apiary is to bees. 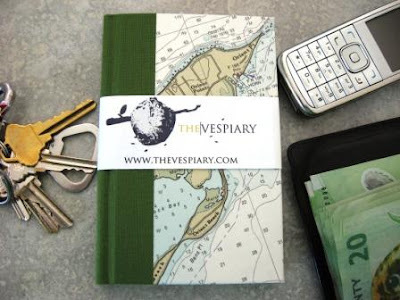 The Vespiary is a book restoration and bindery, the home business of a lady out there in Montana. Montana – memories of reading and watching westerns, the Badlands…where exactly is (are?) the Badlands? It seems a hard place to pin down. The Vespiary has also taught me another word – upcycling. The Vespiaries products are all handmade. 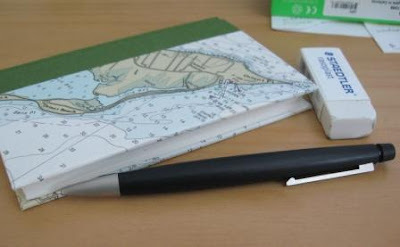 My notebook is a small hardcover notebook, 140mm tall x 95mm wide x 14mm thick. It oozes sturdiness. The pages are plain unlined white paper. I’m no expert on paper, but this paper feels a little thicker, and has a rougher surface finish than standard copier type papers. More sketch paper than writing or copy paper. I would suspect the paper might have some bleed through issues with fountain pen ink, but that’s outside my line of interest! 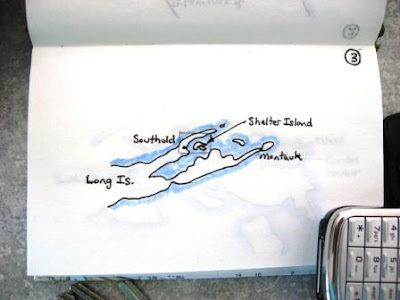 The notebook is covered in an upcycled map, and at the time it seemed like a good idea to practice my map sketching skills and work out just where in the world my notebook cover was. 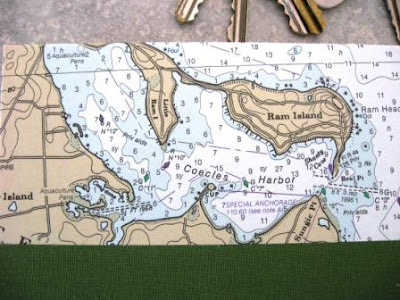 Look hard for the little penciled rectangles to lead you to the next map. The quality of the materials and workmanship seems very high. Certainly the standard of finishing is as good as what I see on expensive notebooks in retail shops. Being hardcover it’s not really suitable as a pocket notebook for me, but I have been using it as a desk notebook and like it very much. Big typo in my recent posting about Following. The Friend Connect system means you DO NOT need to have your own blog to Follow other blogs. Late last year a reader from the USA, ‘Barrel Of A Pencil’ sent me an unusual gift, his nomination for the title of worst mechanical pencil in the world, the Papermate Write Bros. In the end I didn’t agree with his assessment, but we both agreed that it definitely was a piece of P*p#rm*t#!. Stirred by that review, another reader ‘Mindstorm81’ (also known as Peter from Wollongong, Australia) decided that since he really quite liked his particular Papermate he should try and balance the scales, redeem the Papermate name, and so I received a little Christmas present from him, the Papermate Pacer Executive mechanical pencil. Considering how I ended up with a Pacer Executive I felt sure that it would be a reasonably good pencil, but the question was, just what sort a Christmas experience would it provide? Something to match ‘White Christmas’, ‘Miracle on 34th Street’ and ‘It’s A Wonderful Life’ or perhaps instead it would be more akin to Billy Bob’s ‘Bad Santa’ – great fun but leaving you feeling a little dirty the next day? 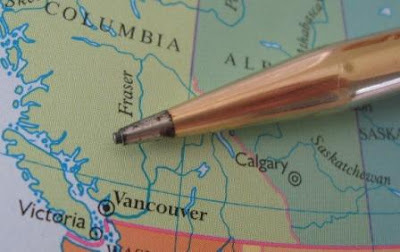 The Pacer Executive is not listed on the current Papermate USA/International website, and most web searches seem to end up pointing to Australia. I did find a thread on an international discussion board from late 2007 indicating that the Pacer Executive was being phased-out, but from where? 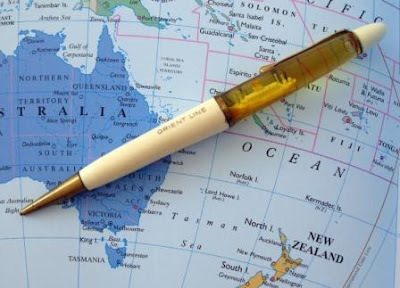 If you download the Australian product list from Papermate Australia you will find the Pacer Executive, with item code S18035570 and EAN Barcode 9300627125225. This barcode number is interesting because it is an Australian registered barcode. 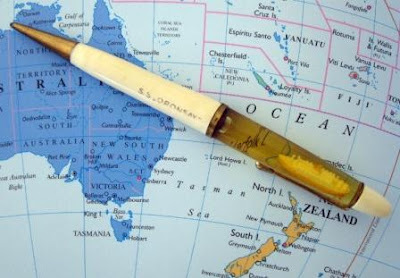 Perhaps it used to be more widely distributed, but I am tempted to think that the Pacer Executive is now offered only by Sanford Papermate Australia. Well, lets get on with it, so here we have the Papermate Pacer Executive mechanical pencil. Photo clickable for high res. Stainless steel body with black plastic grip and end section. Although it’s a stainless steel body, this is still quite a lightweight pencil. Quite frankly it looks rather smart and business executive like, and feels pretty good in the hand too. 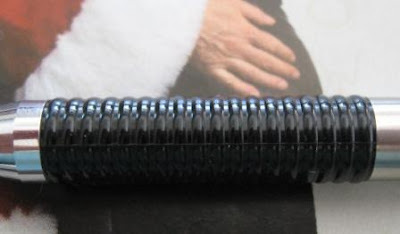 The grip zone is a one piece moulded section in hard black shiny plastic. Raised rings are the grip enhancement, and overall they work quite well. I’d rate this grip as better then average, but it is a relatively narrow diameter. The tip section is a tapering cone, and the lead sleeve is a thin pipe, which looks needle sharp coming out of the bluntish tip. The lead sleeve is fully retractable for pocket safety – you wouldn’t want to ruin that executive business suit! The sleeve is 3mm long so you could probably use this as a draughting pencil if you wanted, but there is a little play in the lead sleeve, perhaps more than other retractable sleeves, so that could be a problem for those who demand the highest levels of lead precision. The lead advance mechanism is the usual push top ratchet. Ten clicks will get you 7mm of the 0.5mm lead. The mechanism feels strong and smooth like it is good quality. 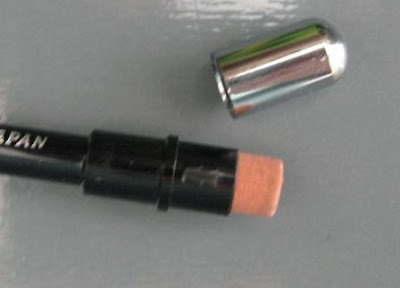 The metal top cap pulls off to reveal an eraser, which looks to be a traditional rubber rather than a plastic compound. 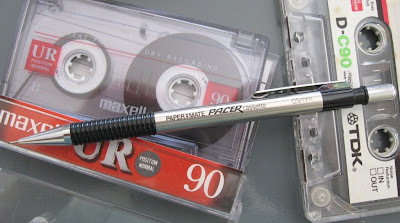 As far as my memory serves me, the Pacer Executive is the first cassette refill pencil to be fully reviewed on my blog. I don’t have many cassette pencils and thus don’t have much experience with them. A cassette refill system obviously increases the manufacturers chances of getting follow up lead refill sales of the cassette. Being held captive to a specific brand of refills always nags at me, but the retail price of refills for the Pacer Executive is competitive with ordinary loose leads so my fear of being ripped off appears to be unfounded. Of course you are still limited to Papermate lead in the selection of grades they choose to offer in the cassette system. 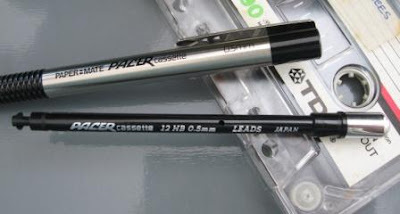 If the Papermate lead and hardness grades don’t suit you, you can cheat the system by refilling the cassette in through the pencil tip. If you are doing so, I think its best to only refill a few sticks as I have had had some problems with cassettes jamming when trying to refill them back up to their specified maximum capacity. The whole cassette pulls easily out of the pencil – just grab the black section above the pocket clip and yank the whole thing out. A new cassette can then simply be pushed back in. 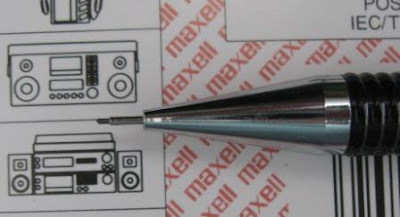 The cassette holds 12 leads, and the word “Japan” is one of the markings on the cassette body. The pocket clip is a plain simple piece of steel but quite strong and effective. 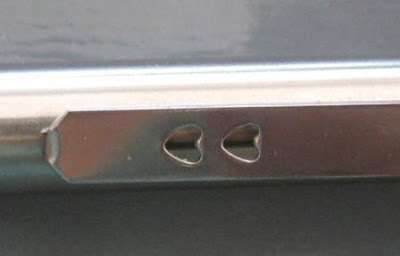 The Papermate hearts are punched into it. The black plastic clip mount has “Japan” moulded into it. Final verdict then? This is a nice pencil, and brings credit to the Papermate brand. Definitely closer to ‘It’s A Wonderful Life’ than ‘Bad Santa’. Best Points – I like the needle sharp look of the lead sleeve. Cassette refills are competitively priced. Not So Good Points – Nothing much leaps out at me. Does this pencil make it into the Top 5? – Despite a “positive” review, No. Dimensions – Length 149mm, diameter 9mm at grip zone. Balance point about 70mm up from the tip. In the early and mid 1900’s Wahl Eversharp were one of the big US writing instrument manufacturers. Back in those days international commerce was very restricted, and so to tap into overseas markets many US companies set up subsidiary factories in the UK, Europe, etc. 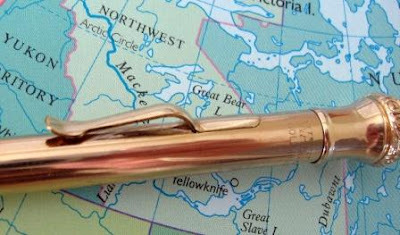 To facilitate sales within the dominions, colonies, protectorates, mandates and other territories of the Empire, Wahl Eversharp had factories in the UK and Canada. 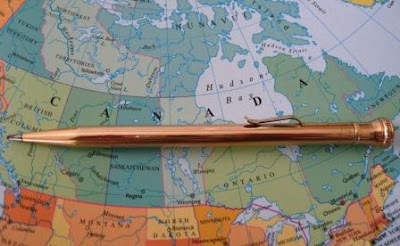 Here’s a very nice and shiny gold filled old pencil from Wahl Eversharp Canada. Like many Eversharps of this time, the body and top of the pencil are reminiscent of Greek and Roman columns. In this case a plain unadorned body and a capital that looks somewhat Ionic inspired, but hey, I’m no architect. 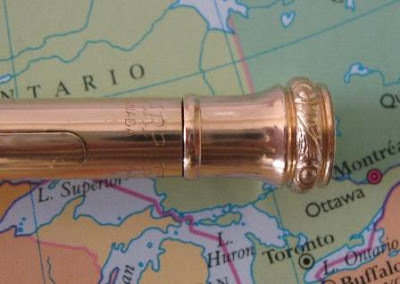 Engraved around the top of the body is “Wahl Eversharp”, “Gold Filled” and “Made In Canada”. I note that no patent is claimed. As usual the pocket clip looks rather pathetic and annoyingly spatulate. To my eyes these sort of pocket clips detract from the pencil, but I guess they saw things differently back in those days. The mechanism is a screw mechanism, taking 1.18mm leads. It’s propel only, meaning it’s a one way trip for the graphite - once advanced, the lead cannot be retracted back into the tip. As usual the very end of the tip is base metal rather than gold filled. A plain but very beautiful old pencil. Just a pity about that damn pocket clip. Not really Housekeeping, but just a thankyou to my "Followers" - those of you who have listed me as a blog you follow. It's appreciated, good to know who you are and I do check your blogs from time to time. Here's what following is if you are interested. You need to have your own blog to be a follower. Finally, I have been and still am super busy with non-pencil matters lately, but I should get at least one post up per week, starting soon. Down at the end of the sidebar should be a new addition Recent Comments, being the last 25 comments. Quite a few people have asked for a longer list of comments, but the "Latest Comments" gadget only allows 5 comments. The "Recent Comments" widget allows more - I've set 25 - but it seems a bit flakey. Can you see the comments? Does it distort your browser view? Do you like or dislike it? 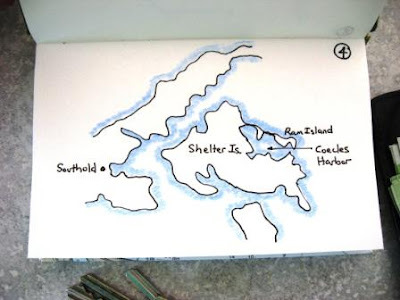 This article is Part 1 of a joint publication with Pencil Talk. Tane, son of Sky Father and Earth Mother, god of the forests, and the birds and insects within them, was one of the supreme gods of the Maori, the indigenous people of New Zealand. In some legends he was also the creator of mankind. Kauri is thus one of New Zealand’s most prestigious trees and is a preferred wood for high quality wooden furniture, and ornamental and heirloom items, such as jewellery boxes, clock cases, etc. Millenia ago, in the north of New Zealand, by some unexplained act of nature, kauri trees started falling over and being submerged in peat swamps. Being buried in the peat swamps preserved the trees. Nowadays they are being dug out from the swamps, and this ancient kauri is remarkably well preserved, still workable and usable for many purposes. 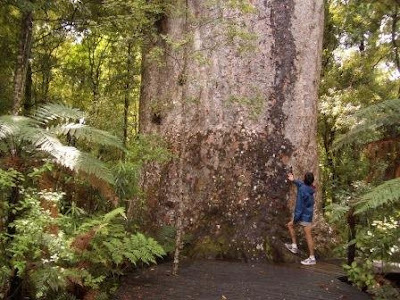 When I say ancient kauri, I mean ancient. Extensive radiocarbon dating shows that these trees grew 30 to 50 thousand years ago. I’ll repeat that, this wood is up to 50,000 years old. That’s way before the last “Ice Age”. If you believe in evolution, then it’s the same sort of time as modern humans were spreading out from Africa to colonise the rest of the world. 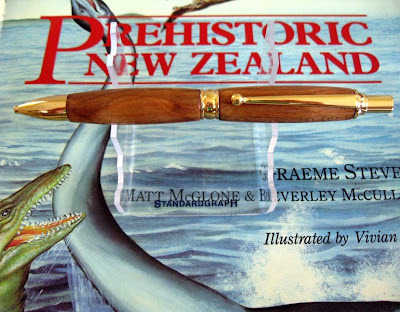 I have previously posted an article on a ballpoint pen turned by my uncle from ancient matai wood that was similarly preserved in a swamp. 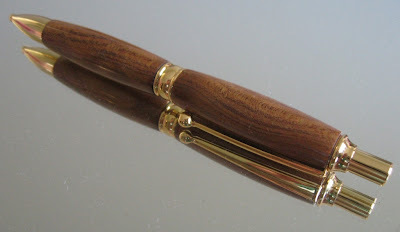 Stephen from Pencil Talk recently contacted me about a pen he saw for sale on the net. It was made from ancient kauri which he wasn’t sure about and wondered if it was some sort of scam. 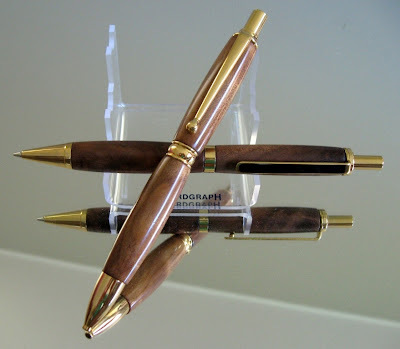 That got me thinking – why not contact a local pen turner and commission some pencils in ancient kauri? 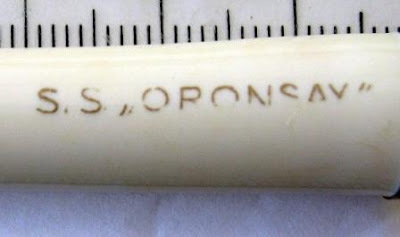 A pencil made from wood that was fifty thousand years old - surely any pencil person would find that an interesting item? After a month or two, the commission was completed, and thus we present the PSI 2mm Power Pencil in Ancient Kauri with 24K Gold Trims. Please navigate back here afterwards, but right now, for Part 2 of this article, please now click through to Pencil Talk. All photos below are clickable for high res viewing. 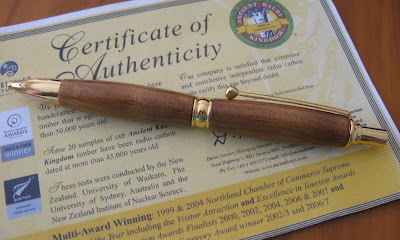 The PSI 2mm Power Pencil in Ancient Kauri with 24K Gold Trims. Power Pencil and the PSI 0.7mm Slimline Pro in Ancient Kauri with 24K Gold and Black Trims. Just in case you are interested, some song and dance by Tane’s people. An extra special hello to the seven of you who, like me, live in “Elsewhere”. Apart from the grand total, no real surprises in the results. I continue to suspect that Japanese people don’t like voting on my Polls. The number of hits via Japanese language feed services that regularly arrive shortly after I publish is about two times the number of votes. 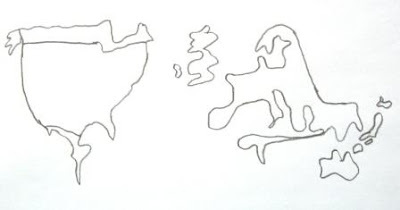 Quiz 1 below has a little cartogram of the results. Here’s an interesting triple set I picked up at auction late last year. 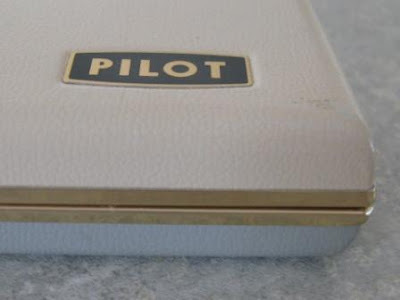 It appears to be “new old stock” or “NOS”, and is a triple set by Pilot of Japan. From top to bottom we have ballpoint pen, fountain pen, mechanical pencil. The little sticker-wrappers on the items identify the FP as a 57G2 and the MP as a EH300. There is no sticker on the BP so I don’t know its model designation. The pen case is nice plush red velvet on the inside. The outside is a little unusual in that the two case halves are different colours. 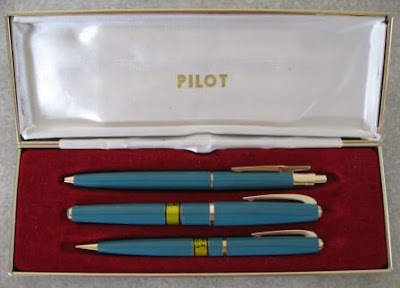 The writing instruments are all a turquoise sort of colour with gold trims. Personally I find it a rather unappealing colour. 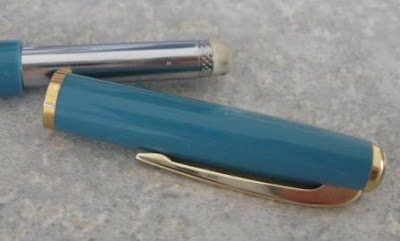 The fountain pen Mechanical pencil It is a screw mechanism. Winding the top half advances and retracts the 0.9mm lead. 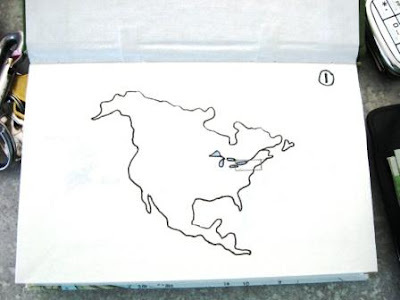 Pull the top half of the body off to access the eraser. Underneath the eraser there is lead storage. But it’s an old fashioned screw mechanism so that’s just storage. You feed new leads in via the tip. Despite my feelings about the colour scheme it’s a mighty nice set, and in great condition. A complete guess, but I imagine it dates to sometime around 1970 – 1980.